Polished concrete is becoming the flooring of choice for countless retail, warehouse, school, and office facilities across the nation. 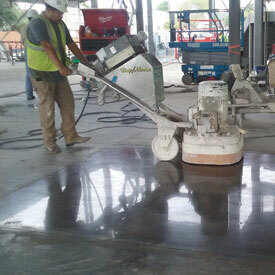 With recent advances in polishing equipment and techniques, companies such as Riverbed Concrete, LLC, in Boerne, Texas, are grinding concrete floor surfaces, whether new or old, to a high-gloss finish that never needs waxes or coatings. “They offer cost savings and a sustainable flooring alternative to marble, granite, tile, and carpet. Polished concrete floors also provide superior durability in high traffic, a longer service life, resistance to moisture, and they need less maintenance,” he adds. 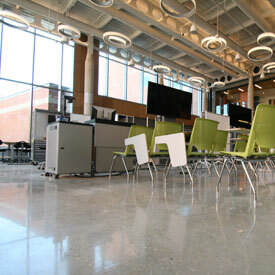 Yet, another advantage is the stunning, customized look a facility can obtain. The choice of highly intricate and artistic designs and patterns, ranging from subtle, mottled hues and textures, to vivid explosions of bright, bold colors, is practically limitless – especially in the hands of skilled artisans like those at Riverbed Concrete. Founded as a modest startup in 2003 in the Texas Hill Country about 25 miles west of San Antonio, Riverbed Concrete quickly rose to become an innovative leader in decorative concrete flooring. It is now one of the top-grossing companies in the market. Approximately 95 to 98% of Riverbed Concrete’s projects are commercial, and the company installs hundreds of thousands of square feet of flooring annually. 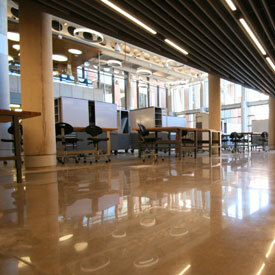 To ensure high-quality flooring, the company maintains both certified and “elite” installers. 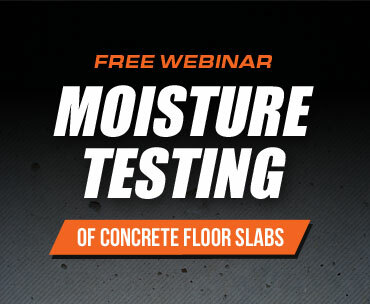 They also provide educational seminars to general contractors, owners, and architects to help them stay abreast of advances in Riverbed Concrete products and services, as well as the industry as a whole. While Riverbed Concrete offers pre-cast concrete countertops, stained and sealed concrete flooring, and a variety of concrete floor coatings, its specialty is diamond-polished concrete flooring. The diamond polishing process requires considerable expertise and the use of specialized heavy-duty machines to gradually grind down the concrete surface. After the grinding, a chemical densifier is added to harden the surface. The next step involves polishing machines equipped with diamond-impregnated pads that refine and polish the concrete surface to a predetermined sheen varying in gloss levels from 400 to 3000 grit. This process produces a very wear tolerant surface that is more durable than coated concrete and generally requires much less maintenance. These are benefits that Riverbed Concrete clientele (including Valero, Walgreens, Walmart, as well as schools, universities, and restaurants) consider very desirable. To ensure their coating and polished concrete flooring installations meet all the architectural specifications for the job, Riverbed Concrete is meticulous when it comes to important details, including testing the concrete’s moisture condition. To avoid moisture-related problems and costly callbacks after the installation, Riverbed Concrete ensures that the slab has reached an acceptable relative humidity (RH) level before starting the polishing process. They abide by what’s in the specifications, red flagging any areas showing higher than tolerated moisture levels. 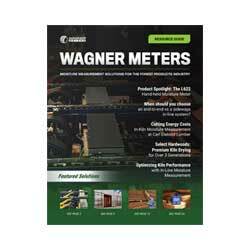 Or if not specified, they go by the manufacturer’s recommendations. “For coatings, moisture testing is important to ensure proper adhesion of the coating and to prevent ghosting and de-lamination. It’s also vital for colorfastness,” Harris says. Harris notes that his company does a lot of repeat business for some fairly prominent clients. 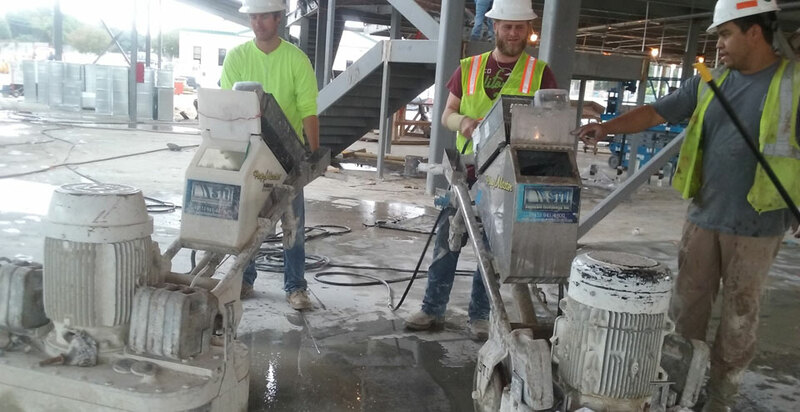 To ensure continuing business with them for years to come, he says every polished concrete flooring installation Riverbed Concrete does is done right and to specification.